Verify your design of LED driving circuit: direct drive by PSU [choose a constant current (C.C.) 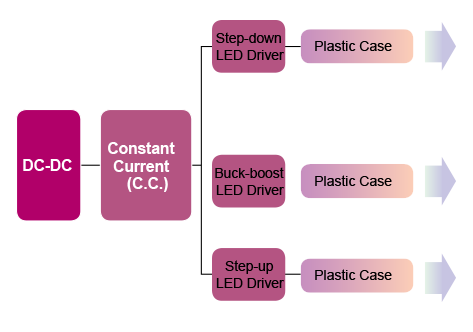 mode LED power supply] or add additional driving IC to get a more precise constant current level [choose LDD, LDH or LDB]. Verify location of assembly and the required level against dust and humidity for the LED power supply (enclosure style, IP level, dry/damp/wet location). Using MEAN WELL's C.V. + C.C. mode or C.C. mode LED power supply as constant current source and feed the LED arrays directly. Using AC/DC C.V. mode LED power supply and separate DC/DC LED drivers. At the moment of power on, the LED power supply will work in C.V. mode and can provide a peak output current; after the LED turns on, the LED power supply will go into C.C. mode. The C.C. only LED power supplies are suitable for directly driving LED modules, but not suitable for connecting with additional DC-DC LED drivers. Single-Stage PFC : No hold-up time and higher Ripple & Noise. Not recommended to use in regions with unstable utility. 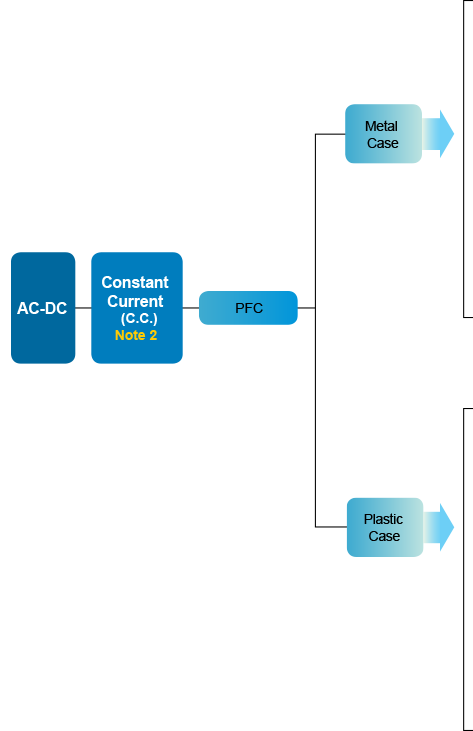 Two-Stage PFC : Longer hold-up time and lower Ripple & Noise. Suitable for LED lighting and general industrial applications. Non-PFC : PF<0.6 and target at regions where PF compliance is not required. 3-in-1 dimming: 1~10Vdc, PWM signal, or resistance. Timer: Timer dimming function, please contact MEAN WELL for details. ★ are popular models and will have sufficient stock for prompt delivery of high quantity orders.